The Canon L550 is a great printer for those everyday printing jobs. At some point your Canon L550 will use all of your printer toner, and when it finally happens you'll quickly realise that replacement Canon L550 toner can be really expensive. But you don't have to get worried about dishing out the high fees you'll get on the main street because now at Cartridge Save you can purchase all the Canon L 550 cartridges you'll need at very small prices. Save a lot of money by shopping at Cartridge Save! It makes little sense to pay so much more for the L-550 original cartridge or L550 compatible toner down the main street when it is simple to save a pile of money shopping with Cartridge Save. Have utter satisfaction when ordering LaserFax L550 toner cartridges from us as they are all covered by a straight forward money back guarantee. Don't forget to take into account that each and every order also comes with free delivery, generally arriving at your doorstep the next business day! 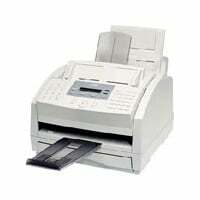 The Canon L550 is a fax machine and copier in one. This model has a scanning resolution of 16 dot / mm by 15.4 line / mm for ultra fine and a copy resolution of 1,200 x 1,200 dpi. The Canon L-550 printer has a sheetfed scanner and it can handle media as large as an A4. The standard fax memory is 8 MB and it can save 510 sheets but this can be upgraded to 40 MB, which can save up to 2,550 sheets. The Canon L550 fax machine does not offer connectivity to computers and it does not have standard handset. With the Super G3 at transmission 33.6 kbps, the Canon L550 has a speed of two seconds. This model also has a copy speed of 18 cpm. This fax machine has an organised control panel with labelled function buttons, navigation buttons, a numeric keypad, and an LCD display. The Canon L550 mono fax has a standard 300-sheet input capacity but optional cassettes are offered. The Canon L550 laser fax has handy features including automatic changeover, send delay, communication history display, and more. This device also has one-touch dial options and it can save up to 210 locations. The Canon L550 mono laser printer has decent speed and it offers good quality faxes and copies. This model can use recycled Canon FX4 cartridges as a cheaper alternative to the genuine Canon L550 fax cartridge. This fax machine lacks a flatbed scanner to allow faxing and copying of 3D objects and books. The L550 fax needs a more intuitive control panel with a larger display, plus more connectivity options.